Bouncer is a new paid application for Google's Android operating system designed to give users more control over application permissions. Permissions give applications extra things that they may access or do and while that is required sometimes for an application to function properly, it is not needed or even abused at other times. While you could go ahead and only install apps that don't require extra permissions or toggle permissions manually each time you use an application, it is not really that comfortable of a solution. Note: Bouncer is not free but available for a one-time price of $0.99 or €0.89. The app requests no extra permissions but two accessibility features that it relies on for its functionality. Tip: Check out reviews of other Android privacy apps such as Lumen Privacy Monitor, Haven, Privacy Hawk, or Privacy Grade. Bouncer takes care of extra permissions that applications request on Android for the user; it does so to improve privacy, battery life and sometimes even security. What is great about Bouncer is that it is a fully automated solution that revokes permissions that you may have granted an application if you want that to happen. Keep the permission for one hour. Revoke the permission when you press the Home button. Bouncer will revoke the permission if you select options 2 or 3. You will notice that Bouncer will revoke the permission automatically by opening the application's permissions on the device and toggling the permissions that you granted; all automated. There are some restrictions. 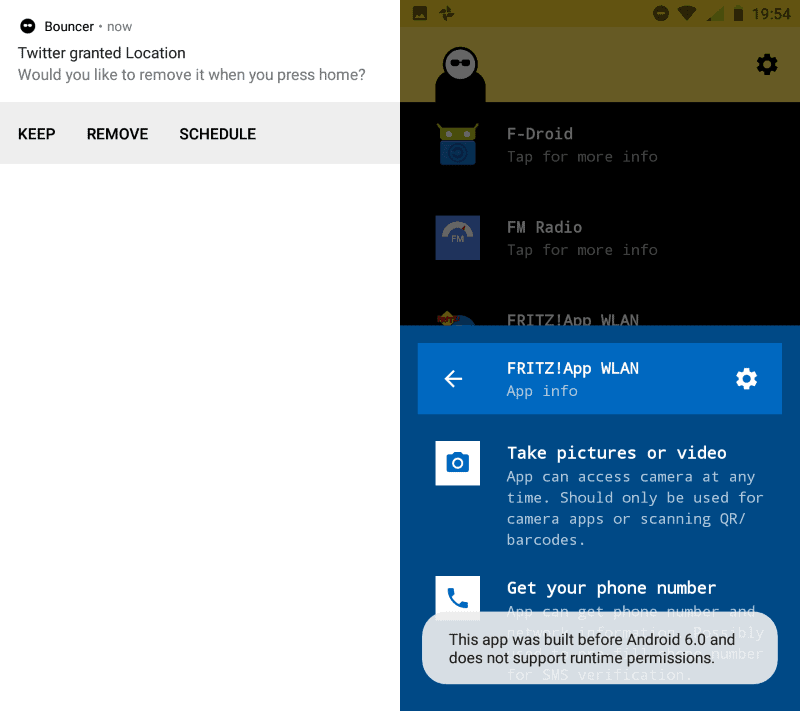 First, that Bouncer works only with Android 6.0 and higher apps as it requires runtime permissions. Second, that it does not work with apps that you have granted permissions already in the past before Bouncer's installation. There is a workaround for the second restriction, however. Open Bouncer and switch to the all apps listing. Tap on any app that you want to revoke permissions for, select the permission, and let Bouncer revoke it for you using built-in Android settings. 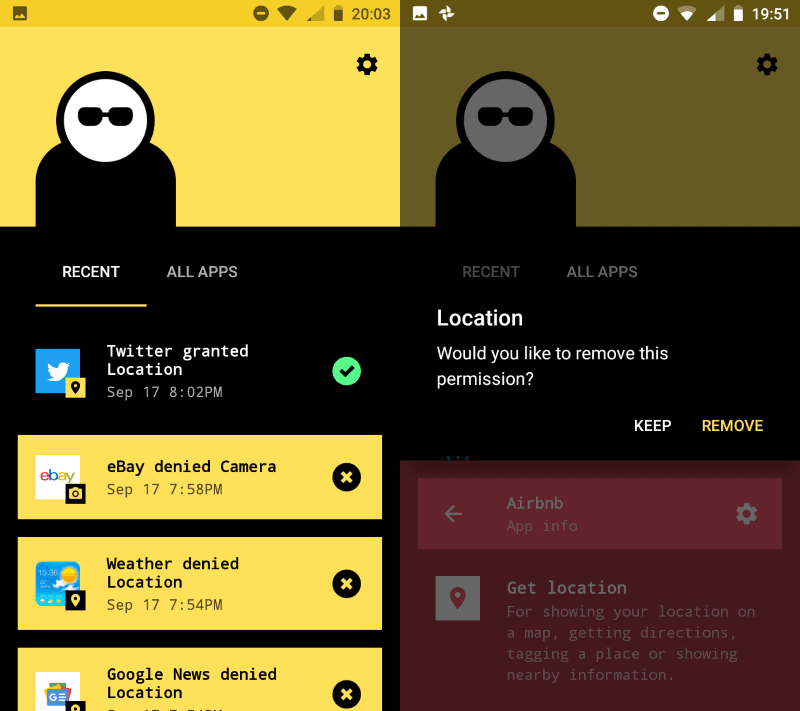 The process is straightforward but Bouncer does not highlight which apps have requested "problematic or dangerous" permissions and which have not in the listing. Once you are done going though the list Bouncer will notice any permission requests of the application's so that you may tell Bouncer what to do about it. Bouncer lists permission changes, e.g. allowed or denied, in the application's main interface. Well, the primary application for Bouncer is to use it to give applications temporary permissions that are revoked automatically by the app after use. Sometimes, you may want to give the maps app permissions to use your location, or may want to tag a location or take a photo using applications; that's where Bouncer comes in as it makes those permissions temporary if you wish so. Bouncer does not fake permissions like some custom Android ROMs or root applications do. Means, if you grant a permission the app may make use of it. Bouncer is an application designed to grant Android applications temporary permissions. It is automated in that it removes permissions automatically when you select the option. Bouncer won't set permissions to allow again, however, when you start an application another time after its permissions were revoked. Applications may not work properly if they require certain permissions. Is Bouncer worth the price? That depends entirely on how you use Android. If you need apps to have certain permissions at times but don't want them to have the permissions when you don't run them, then yes, Bouncer may be a useful addition then. On Lineage OS there’s a nice thing called Privacy guard. It blocks permissions at a lower level than Android supports by default. For example you can give an application the permission to read contacts, but if you block that application’s contacts access through Privacy guard, all it can see is an empty list. I think it works for stuff like storage as well. I will eventually install Lineage on my Xiaomi at some point. I loved it on my Nexus 4. A while ago I used Snapchat to talk with someone and that application was intrussive as hell. It forces you to give it storage access. I just needed it for phonecalls, why are you asking me for storage access? Normally I stay away from applications which refuse to work without permissions like phone, messages, contacts, etc. I also find it funny whenever something like Angry Birds is asking me for access to my contacts list. Why?? Martin, how is this a paid application when I can download it for free on my device? I’m with Moto G2 (Android 6.0) and I can no install it. It says my device is not compatible with this app. Is there a list of applications that do not ask for extra permissions anyware? We need a New modell för smartphones. Open hardware run by open software. We also ned to change how we transmit our data. Microwaves are not the best choice for our biology. In the early stage of wifi I found a less dangerous model. For some reason powers that be selected military wavelength. I suggest your all reda open on GLADIO. Antony Sutton did work on helping us understan what we are up against. We need a counter PROJECT!